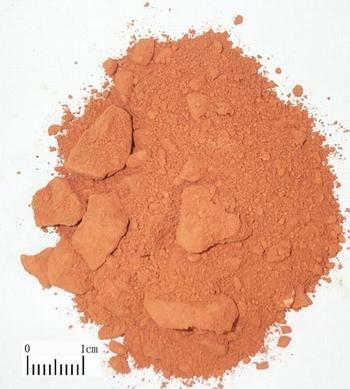 The enhydrous kaolinite of the family Silicate. Mainly contain enhydrous aluminium aluminate. Fujian, Shandong, Henan provinces in China. Mined all the year round, removed gravel. Slight clay flavor, slight flavor, chew it without sand feeling. Red, smooth, exquisite, soft, brittle, absorb water well. Refined with water or refined with water after calcined in the fire. Sweet, astringent, warm; large intestine and stomach meridians entered. Astringe intestines to check diarrhea, astringe to stop bleeding, astringe leukorrhagia, produce skin and cure ulcer when externally used. It is good at astringing intestines to check diarrhea and stopping bleeding. For chronic diarrhea and dysentery due to deficiency cold, it is combined with Yu Yu Liang in mutual reinforcement, such as in the formula Chi Shi Zhi Yu Yu Liang Tang from Shang Han Lun. For chronic dysentery due to deficiency cold, purulent and hematochezia, it is combined with the middle-warming and spleen-tonifying herbs. For instance, it is used with Gan Jiang and Jing Mi in the formula Tao Hua Tang from Shang Han Lun. It is indicated for hematochezia, metrorrhagia and metrostaxis because it can astringe to check bleeding. For hematochezia, it is combined with hemostatic herbs. For instance, it is used with Yu Yu Liang, Long Gu and Di Yu. For metrorrhagia and metrostaxis, it is combined with herbs to strengthen thoroughfare vessels, relieve metrorrhagia. For instance, it is used with Hai Piao Xiao and Ce Bai Ye. For bleeding of digestive tract, it is combined with Bai Ji and San Qi, etc. It can astringe to relieve leukorrhagia. For thin leucorrhea due to kidney deficiency, it is combined with herbs of warming, tonifying and astringing. For instance, it is used with Lu Jiao Shuang, Qian Shi and Hai Piao Xiao. External application can dry dampness, cure ulcer and produce new skin. For ulcer without curing and eczema, it could be smashed into powder singly or combined with herbs, for instance, it is used with Long Gu, Ru Xiang, Mo Yao and Hai Piao Xiao, to paste on the affected areas. Decoct 10~20 g. Proper dosage for external use, smashed and pasted on the affected area. It is contraindicated in cases of diarrhea or dysentery of damp-heat type. Use with caution for pregnant women. It is incompatible to Guan Gui (Rou Gui).